Written documents and verbal traditions only hint at the Man-Lion's lila, for it is a complex subject that provokes the imagination: a ferocious and sanguinary incarnation of God that embodies both human and leonine features - He tears apart Hiranyakasipu with His bare hands, as Hiranyakashipu's son, the young Prahlad, looks on, offering loving prayers to his father's slayer. Steven J. Rosen (Satyaraja Dasa) is a freelance writer and author of ten books, including the popular India's Spiritual Renaissance: The Life & Times of Lord Chaitanya. He's an initiated disciple of His Divine Grace A.C. Bhaktivendanta Swami Prabhupada, the founder & spiritual master of the International Society for Krishna Consciousness. Mr. Rosen's writing and scholarship have developed for him a reputation as an important voice in the Indian religious community. Currently, he is editor of the Journal of Vaishvava Studies, an academic quarterly that is esteemed and supported by scholars throughout the world. 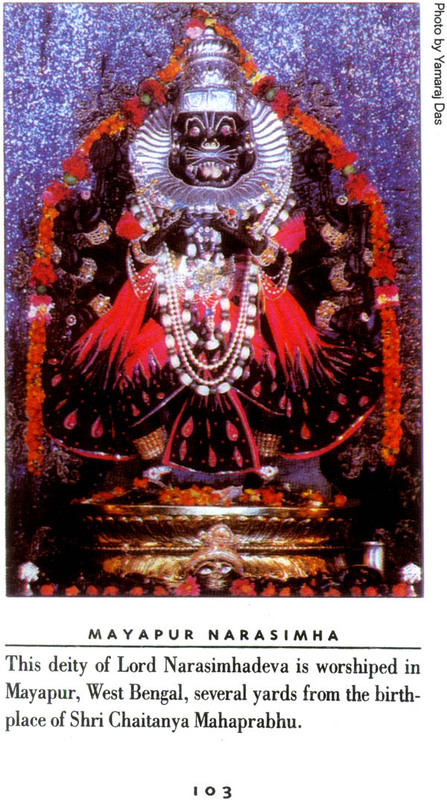 Whether or not one believes in Narasimhadeva-that He is a manifestation of the Supreme Godhead, Vishnu, descended to annihilate the tyrant Hiranyakashipu and bring unimaginable bliss to His intimate devotee, Prahlad-the story has been told and retold for millennia and is believed in by millions of Vaishnavas worldwide. 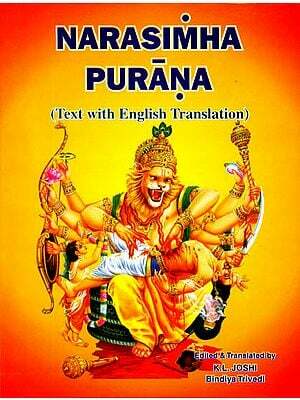 Ancient India's holy scriptures recount Lord Narasimha's pastimes in diverse ways. One will find perhaps the earliest (and shortest) reference to the narrative in the Mahabharata (3.272.56-60). Aside from these four verses, there are seventeen other versions of the story, some short and some long-Bhagavat Purana (2.7.14 and 7.2-10.47); Agni Purana (4.2-3); Brahmanda Purana (2.5.3-29); Vayu Purana (67.61-66); Harivamsha (41 and 3.41-47); Brahma Purana (213.44-79); Vishnudharmottara Purana (1.54); Kurma Purana (1.15.18-72); Matsya Purana (161-163); Padma Purana (Uttara-khanda, 5.42); Shiva Purana (2.5.43 and 3.10-12); Linga Purana (1.95,96); Skanda Purana 7 (2.18.60-130); Vishnu Purana (1.16-20); and in addition there are the numerous "Sthala Puranas," or regional traditions, which are written in vernacular languages and are accepted as scripture by devotees throughout the subcontinent. Certain of these accounts tell the basic story of Narasimha with little or no reference to Prahlad; other versions mention Prahlad and specifically refer to his vision of Lord Narasimha's Universal Form, which he, and only he, had the divine eyes to see; finally we find the very developed story with varied nuances-Prahlad's sainthood becomes a primary theme-as elaborated upon in the Bhagavat Purana. Written documents and verbal traditions, however, can only hint at the Man-Lion's lila, for it is a complex subject that provokes the imagination: a ferocious and sanguinary incarnation of God that embodies both human and leonine features-He tears apart Hiranyakashipu with His bare hands, as Hiranyakashipu's son, the young Prahlad, watches gleefully, offering loving prayers to his father's slayer. 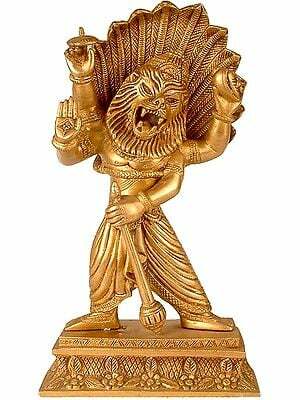 According to some, Lord Narasimha appeared in this world in Satya Yuga, while others say it was in Treta Yuga. 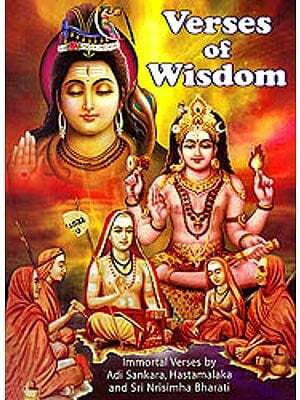 The puranas generally agree, however, that it was at the juncture of the two yugas, the dawn-dusk interval between Satya and Treta, tends of thousands of years ago. This information is augmented by Rupa Goswami, who asserts in his Laghu Bhagavat-amrita (3.65) that the whole affair transpired before the churning of the milk ocean in the reign of the sixth Manu. 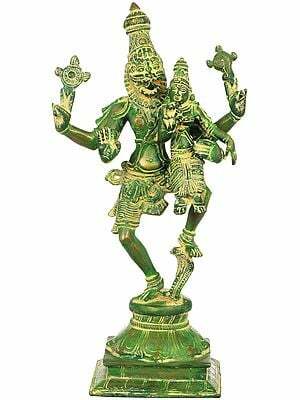 This would push Lord Narasimha's manifestation in this world back millions of years. The ultimate Vedic revelation, of course, suggests that. 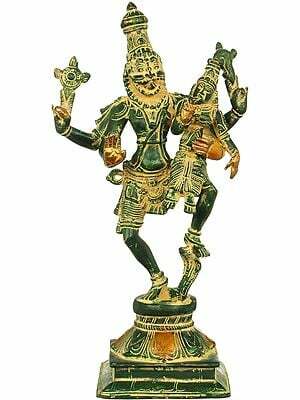 Narasimhadeva's pastimes are timeless, recurring in manifold universes according to the sweet will of the Lord and the desires of His devotees. In fact, it is said that there are various Narasimha incarnations in different kalpas, with diverse pastimes and even diverse forms. 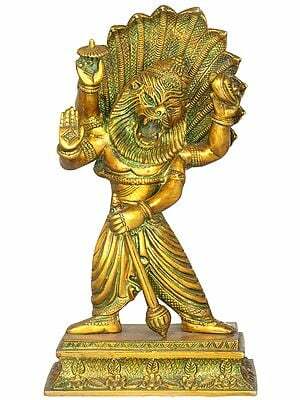 Sometimes He appears as a man-lion, and other times as half man-lion/half boar-sometimes He even appears as a boar, though He is known as Narasimha ("man-lion") in those instances as well. Some say He did not appear on this planet at all. The Bhagavat Purana (5.18.7) tells us that Narasimhadeva resides in the tract of land known as Harivarsha. While in close proximity to Bharata-varsha (the Earth), and in the same middle planetary system, Hari-varsha is a polydimensional universe whose inhabitants enjoy heavenly delights; Lord Narasimha is said to be the presiding Deity there. Elsewhere, the Bhagavat (7.4.8) seems to indicate that the Narasimha tale unfolds on Indra's highest heavenly planet, in his most opulent palace. Some historians say that Prahlad, the boy-devotee in the Narasimha story, was born in the Punjabi city of Mulatan, in the dynasty of Kashyapa Muni. Others say that the Narasimha pastime occurred in Simhacalam, a south Indian state in Andhra Pradesh, while still others opt for Ahobalam, also in Andhra, where there are nine Narasimha Deities (Nava Narasimha Kshetram) and where pious devotees will to this day show visitors the remains of the ugra-stambha, the pillar from which Lord. 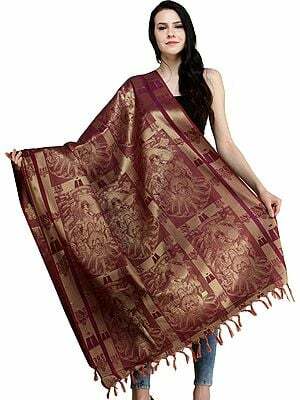 Narasimha is said to have appeared, and even the hill from which Prahlad was supposedly thrown. Also popular in Ahobalam are the ruins known as Prahlad Badi, or the school where the boy-saint was made to study under his demoniac teachers, and Rakta Kunda, a small pond where Narasimha is said to have washed His hands of the blood of Hiranyakashipu. Since my own Narasimha orientation comes from the Gaudiya Vaishnava tradition, I am somewhat familiar with Chaitanya Mahaprabhu's visit to Simhacalam, and the authenticity that this lends to it as a holy place where the Narasimha story may have indeed taken place. On the other hand, His Divine Grace A.D. Bhaktivedanta Swami Prabhupada, a leading Gaudiya saint in the modern age, seemed to acquiesce in regard to the Ahobalam narrative when a disciple informed him that many Shrivaishnavas hold this to be the place of Narasimhadeva's pastimes and that they base their belief on the Brahmanda Purana. Still, Prabhupada and most Vaishnavas today concur that the bulk of the Narasimha tale probably did not talk place on this planet. The Gaudiya tradition holds that Narasimha, Ramachandra, and Krishna are Paravastha Avatars, or "the most important forms of the Lord" (Laghu Bhagavatamrtia, 5.16). 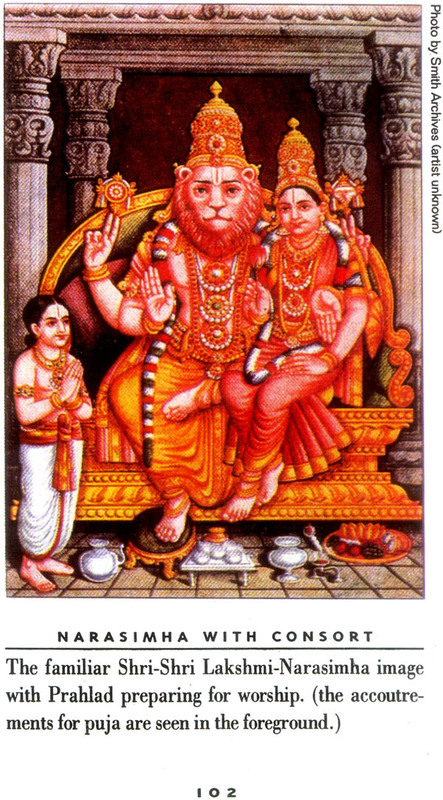 Nonetheless, this same tradition has unique things to say about Narasimha as Ishta-deva, or one's "chosen Lord" That His main function as a Deity is to prevent obstacles on the path of bhakti. And Gaudiya Vaishnavas indeed pray to Him in this way. Thus He is seen as a sort of spiritual counterpart to Ganesh, who is the demigod that thwarts adversity in the material world. Ganesh acquires his power, in fact, from holding Lord Narasimhadeva's feet on his head, as implied in Brahma-samhita (5.50). Gaudiyas also believe that Narasimhadeva came to Bengal to rest after destroying Hiranyakashipu-it is said that He drank from the cooling waters of the Mandakini River, which is no longer extant. Still, the area, which is located on the southeast boundary of Navadvip, is called Narasimha Palli and is considered a holy place to this day. It is not just the Bengali Vaishnavas who have embraced Narasimhadeva as their own. 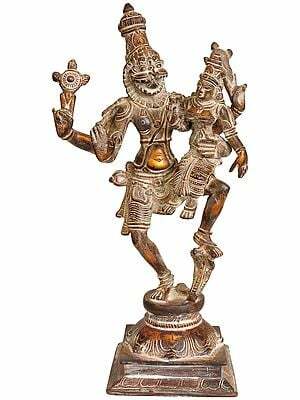 Oriyan Vaishnavas, too, see Lord Narasimha as nondifferent from their Lord Jagannath, and there is an entire school of East-Indian art dedicated to the depiction of a sort of hybrid Narasimha-Jagannath image. 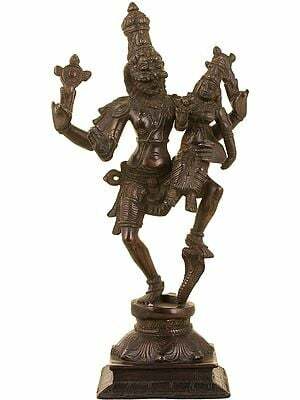 There is also an obscure relationship between Narasimha and the Shaiva deity Bhairava-Ekapada, bringing Narasimhadeva into other Hindu circles as well. 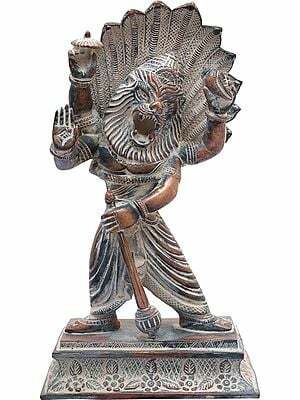 Various forms of Lord Narasimha are described in esoteric Pancharatra literature, specifically the Ishvara-samhita (also called the Narasimhakalpa). This work, and others like it, focuses on homages, mantras and mudras-all with Lord Narasimhadeva as its central image. 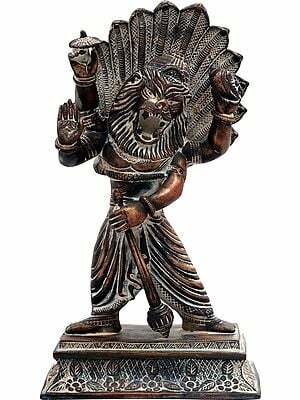 These texts describe ancient Narasimha initiation rituals as well, which can purify all castes, enabling recipients of Narasimha mantras to overcome any spiritual or material obstacle on the path of bhakti. Related to these special Diksha rituals are metaphorical interpretations of the Narasimha story, wherein the Lord's nails are seen as the account-terments of bhakti, which can tar apart one's evil propensities ("hiranyakashipu"). Specific details of Narasimha iconography abound, but two of the most common iconographic images of Narasimha include the diverse battle scenes between the Deity and Hiranyakashipu, and Narasimha disemboweling the demon with His claws. In our picture section at the conclusion of this volume, we have tried to show a variety of Narasimha images, from the benign Lord seated with consort and Prahlad to the brutal destroyer of Hiranyakashipu, from Narasimha in a meditative yoga mandala to Narasimha as the center of all incarnations in a rare print of the Dash-avatar theme, from historic icons in south India and bas-reliefs throughout the subcontinent to forms of Narasihadeva in California and around the world. 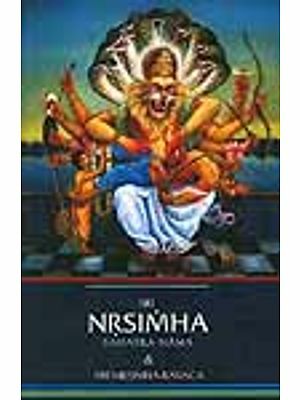 Our Narasimha book begins with an overview of the entire story, incorporating several elements from other sources but focusing on the version found in the Bhagavat Purana. 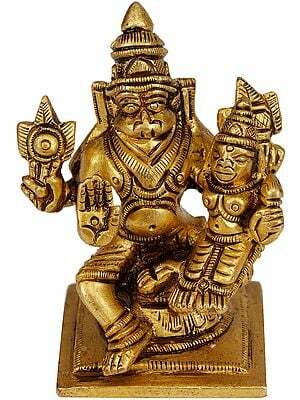 Emphasis will be given here to the Varaha/Hiranyaksha story, for it plays an important role in the development of the Narasimha lila. 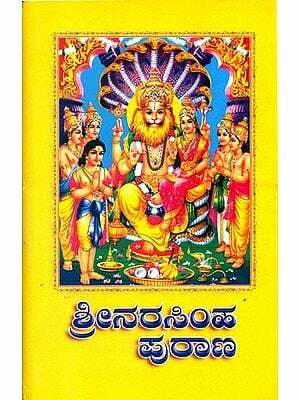 This is followed by a section of prayers to Lord Narasimha, mainly those which were uttered by Prahlad. 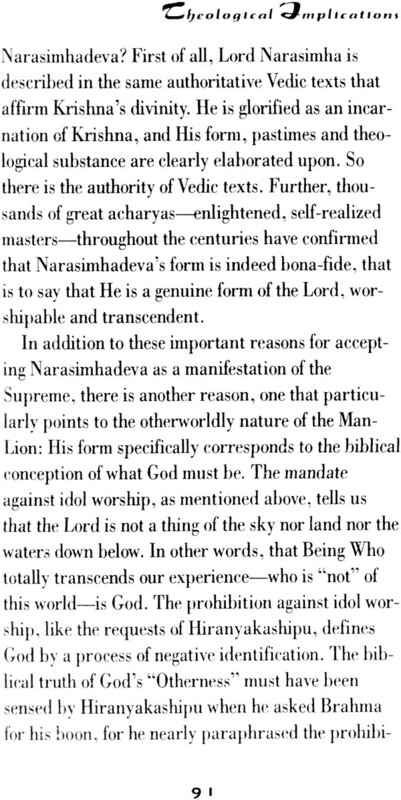 While this section is not exhaustive, it gives an idea of the devotion to Narasimhadeva that exists among Vaishnavas all over the world. After this, in Section Three, we explore the theological implications of the story-Does God have a form? 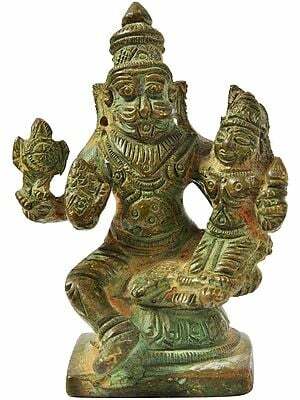 If so, does Narasimha's image qualify as a possible manifestation of this form? What are the implications of God's person hood in terms of Western and Eastern religious sensibilities? And, finally, in Section Four, we include a series of pictures, mentioned above, for Narasimha's visual impact is an important feature of His manifestation, and an indispensable part of His worship. For the use of these pictures, and for other assorted contributions to this volume, I must thanks a variety of friends, not least among them are Dasappa and Gerald Surya, Gopal Bhatta, Gopavrindapal, Andrei Petrov, H. Daniel Smith, Guy Beck, Yogeshvar, Chaturatma, Yamaraj at BTG, Gaur Keshava, Yashodanandan, Indradyumna Swami, Dhriti and Ramdas, Mayapur, Satyanarayana, 108, Steve and Kate, and the tireless devotees of 26 Second Avenue. To all of these devotees and many more-you know who you are!-I owe a tremendous amount of thanks. 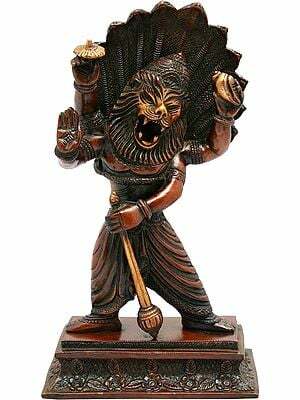 I would like to know more about Lord Narasimha.I also want to know when someone get his trance,what do he ask for(what he needs)?Please could you help me.